Auburn University and the Samuel Ginn College of Engineering have a rich history in harsh environment electronics research. In 1999, the National Science Foundation Center for Advanced Vehicle and Extreme Environment Electronics (CAVE3) was established at Auburn as a national center of excellence in harsh environment electronics. The harsh environment node, which represents Auburn University and Stanford University and a number of companies and government laboratories. Since its inception CAVE3 has formed a number of long-term partnerships among industry, government and academic agencies. The center has benefited from a strong nexus in the area of harsh environment electronics because of a strong presence, in Alabama, of major automotive and transportation companies, including Honda, Kia, Hyundai, Toyota, Mercedes, ThyssenKrup and International Diesel. In addition, the Huntsville area is home to the Redstone Arsenal and more than 238 aerospace and defense companies. Approximately 17 faculty and 53 students are engaged in research projects in various area related to extreme environment electronics. Primary focus of the research is on extreme environments which includes wide temperature extremes, high humidity, exposure to vibration loads and high-g shock loads. The center has extensive capabilities for board and component fabrication and assembly. Accelerated test capabilities are performed for thermal cycling and humidity exposure capable of addressing wide temperature extremes from geothermal applications to space environments. Mechanical shock capabilities include shock towers capable of 100,000g of acceleration. Notable non-destructive inspection capabilities include X-ray MicroCT system with 3D rendering capabilities. The National Science Foundation Center for Advanced Vehicle and Extreme Environment Electronics (CAVE3) has a demonstrated focus on electronics reliability in extreme environments and its research capabilities include several laboratories. The Center is in Phase-III of the NSF IUCRC grant award. Research in the center is supported by 29 members. The laboratory has a full suite of computer-aided design, and high-end simulation tools. Computer-aided design tools include pro-engineer and solid edge. Simulation tools include, ANSYS, LS-DYNA, ABAQUS, ABAQUS/Explicit, NASTRAN and MATLAB. The laboratory is well equipped with dual processor pentium-class workstations, and Unix multi-processor compute server. The laboratory houses state-of-art tools used for measurement of high-speed, high strain rate transient dynamic events such as shock and vibration. Equipment includes high speed data acquisition systems, Vision Research Phantom-Series high-speed camera capable of 275,000 fps, SAI 3D image tracking software for high-speed image analysis and measurement, oscilloscopes, HP Spectrum Analyzers, vishay instruments 2311 high-speed wide-band strain-gage amplifier, motion-control drop tower, LDS v700 Series vibration system. 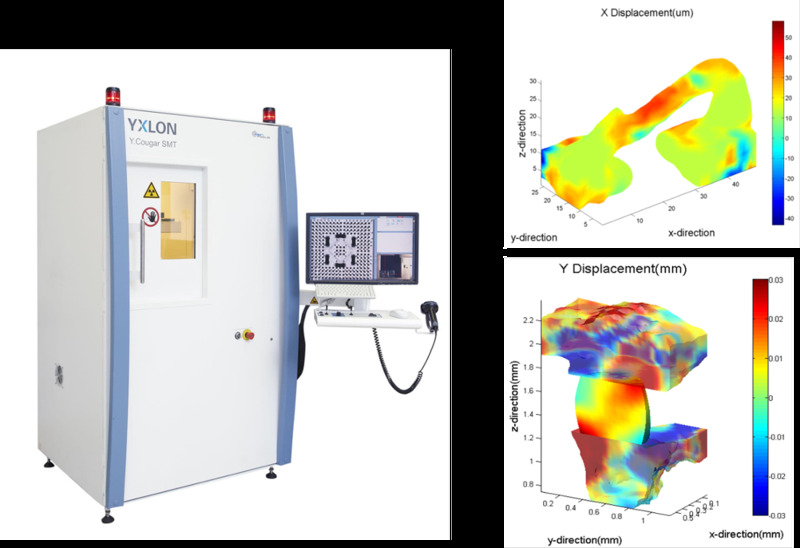 Full-field strain measurement capabilities using digital image correlation. The laboratory has a CT scan capability which allows the examination of defects and failure modes including voids, cracks, delamination with a micron-level resolution. Reconstruction tools such as volume graphics are also available in the laboratory. Our facilities and laboratories include the most cutting-edge electronic packaging equipment such as the Air Vac DRS24 solder rework station, Semiconductor Equipment Corporation 4150 Split Optics Alignment System for die placement, Karl Suss thermocompression flip chip bonder, Yield Engineering YES-R3 plasma etch System, Palomar products Model 2460-V automatic thermosonic wire bonder, K&S Model 2071 VFP automatic wedge bonder, Asymtek Model 402 dispensing system, Fisher Scientific programmable cure oven, ATV Model PEO 601 programmable brazing furnace, SST 3150 vacuum sealing furnace. 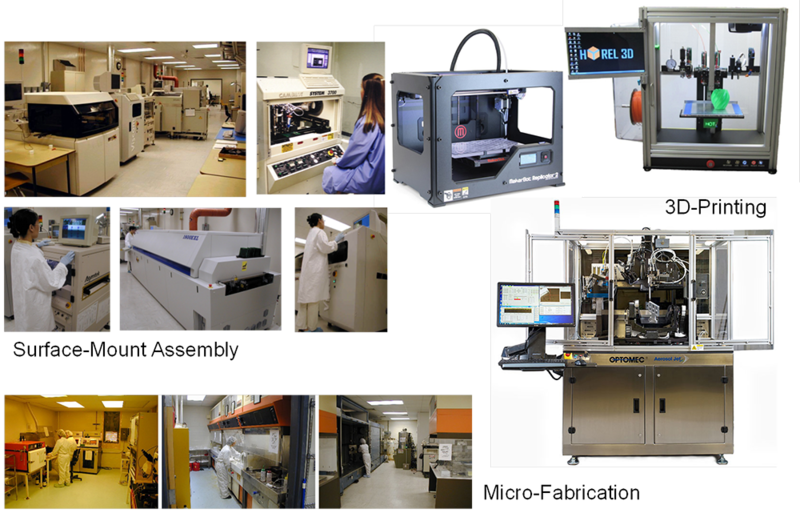 The assembly and packaging resources are supported by inspection and failure analysis equipment including a Phoenix micro-focus x-ray system, Sonix C-mode scanning acoustic microscopy (CSAM) system, WYCO wafer inspection system, Tencor surface profilometer, Brookfield viscometer, Dage PC2400 pull and shear tester, and optical and scanning electron microscopes. This laboratory includes capabilities for imposing various steady-state and cyclic temperature and humidity stresses. Chambers includes 3 Blue-M thermal cycling ovens, two liquid-to-liquid thermal shock systems, a Ransco air-to-air thermal shock system, two humidity chambers, and an express test HAST chamber. Major equipment includes Instron 3367 with several load cells, LVDTs, Blue-Hill software, micro-scale mechanical testing system, facilities for calibration and application of stress and thermal test chips, and an environmental vibration system, an infrared thermal imaging system, and several custom-built apparatuses for characterizing thermal resistance of materials and assemblies. The Surface Science laboratory includes several Scanning Electronic Microscopes (SEMs) with heating capabilities, and a Transmission Electron Microscope (TEM). Method capabilities include Energy Dispersive X-Ray Spectroscopy (EDS), X-Ray Photoelectron Spectroscopy (XPS), Scanning Auger Spectroscopy (SAS), and Rutherford Backscattering Spectroscopy (RBS). CHA Mark 50 dual E-beam/sputter/ion gun deposition system, plasma reactive ion etcher, applied materials 8130 metal etcher, applied materials 8110 oxide etcher, applied materials 8110 oxide etcher, Matrix 103 asher, Matrix 303 etcher, Karl Suss MA/BA 6 frontside/backside mask aligner, wet benches, thermco oxidation and diffusion furnaces, Tempress LPCVD system, nickel and gold plating, STS ASE 100 DRIE, STS AOE 100 DRIE, CO2 critical point dryer, room temperature ion deposition/milling system. We have access to world-class facilities including the Stanford Nanofabrication Facility (SNF), the Stanford Nanocharacterization Lab (SNL) and the Stanford Nano Center (SNC). These campus-wide shared facilities are part of the National Nanotechnology Infrastructure Network (NNIN) funded by the National Science Foundation (NSF) with management support from Stanford University. In addition, we have access to unique characterization equipment for performing wide range of experiments to study the electrical and thermal properties of devices. All of these will support the proposed research. It is envisioned that the potential for adoption of the flexible electronics technologies for high volume consumer products will be greatly increased through reduction in the risk-related to the use of the flexible architectures. The reduction in the risk will be achieved through the efforts on enablement of infrastructure technologies and populating the NextFlex harsh node’s technology shelf. The infrastructure technologies are foundational technologies that impact a number of different technology demonstrators including - Human performance and medical devices, IoT, wearable electronics, vehicle structural sensors, information devices and RF, communication components and DOD unique applications. The technology demonstrators will populate the technology shelf as well. It is envisioned that the NextFlex harsh node’s efforts in the area of infrastructure technologies will result in the creation of proprietary technologies and result in reduction of risk related to the broader use of flexible technologies through better understanding of – scalability for high volume production, characterization of process windows, potential defects and solutions, process controls, expected defect rates in ppm or ppb. The NextFlex harsh node on flexible hybrid electronics will focus on the transitioning TRL4 infrastructure technologies and cross the chasm between laboratory research and high volume product implementation. In this program, the technology diffusion time will be greatly reduced through IMI’s ecosystem in partnership with industry and academia for the creation of a technology shelf and technology demonstrators.